AVALON — Scuba divers are preparing once again to band together to enjoy a group dive and raise funds for the Catalina Hyperbaric Chamber, May 2. Known as the largest single-day scuba charity event in the United States, Chamber Day brings in nearly 50 percent of the annual budget costs necessary to operate the facility that aims to keep divers safe. 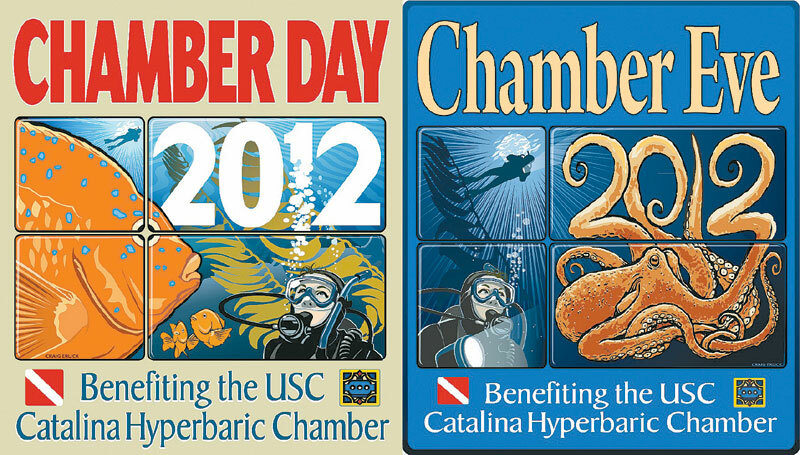 “Our Catalina Chamber is the only hyperbaric chamber in Southern California dedicated solely to the treatment of diving accidents, on a 24/7/365 basis,” said Ken Kurtis, who has chaired the event since the early 1990s. Each year, the diving community comes together for the benefit of the Catalina Hyperbaric Chamber, which is used to treat various scuba-diving-related ailments. “Although we all hope we’ll never need it, having our chamber available provides divers with a vital safety net when something goes wrong,” Kurtis said. Last year, the event raised more than $117,000 in funds to be used for the chamber’s operation. On average, around 250 divers participate in the event, with around 500 participants joining in for the Chamber Eve dinner and raffle. For those interested in participating in the dive, the cost is a $90 donation to the Catalina Hyperbaric Chamber, along with a $30 fee to go toward food and air fills supplied by the dive boats, which donate their services for the event. Participating boats this year are Cee Ray, Giant Stride, Great Escape, Magician, Mr. C, Pacific Star, Riviera, Sand Dollar, Sea Bass, Second Stage, Sundiver, Sundiver Express, Sundiver II and Westbound. Divers sign up and choose the boat they want to take from its respective dock on the mainland to Catalina. Boats will leave at 7 a.m. May 2 and will make two dives at Catalina, before docking in Big Fisherman’s Cove, where divers will disembark and take a 75-minute tour of the Catalina Hyperbaric Chamber operations. Los Angeles County Lifeguards, Coast Guard crews and members of the Los Angeles Sheriff’s Department will provide an overview of their roles in the life-saving hyperbaric chamber process, and chamber staff will give a tour of the facility itself, where divers can go inside and be pressurized to a depth of 1 foot. Most of the boats will arrive back at their docks between 5 and 5:30 p.m., and divers can head over to the Chamber Eve event at the Long Beach Aquarium of the Pacific, starting at 7 p.m. The event features full access to the aquarium, dinner in the Great Hall (under a life-size model of a blue whale), a raffle and the presentation of the Chamber Day check to Karl Huggins, director of the chamber. Those who are not divers or who can’t take the day off can still show their support by boarding the mythical Flying Dutchman — a big part of Chamber Day and an option for those who can’t attend in person. For $90, “Diving” the Dutchman will get you five daytime raffle tickets and a special limited-edition T-shirt. For more information about the events, call (310) 652-4990 or visit chamberday.org.